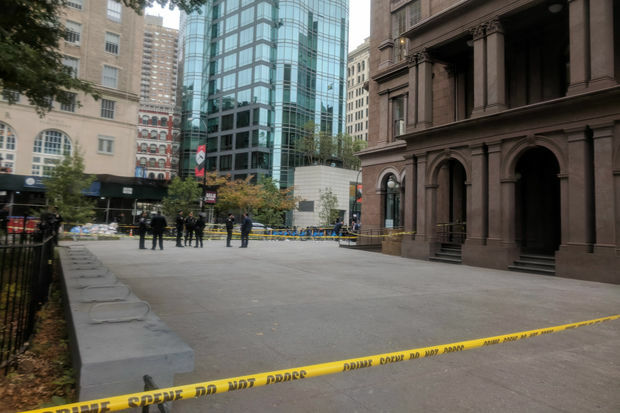 A man and woman suffered life-threatening injuries in a double shooting near the Cooper Union Wednesday morning that may have been a murder-suicide attempt, police said. EAST VILLAGE — A gunman fatally shot his girlfriend near Cooper Union before turning the gun on himself Wednesday morning, police said. The man, 62, shot the woman, 56, and then himself with a handgun near Cooper Square and East Eighth Street just before 8 a.m., NYPD and FDNY officials said. The woman died at Lennox Health Greenwich Village, according to authorities. The gunman was transported to Bellevue Hospital where he was listed in critical condition Wednesday afternoon, police said. Earlier in the day, police officials mistakenly announced he had died. Jerry Simo, 48, who works at a building nearby, said he saw a man dressed in a suede jacket approach the woman and shoot her without any warning. "He didn't say a word. He shot her in the chest both times. It was point-blank range. Her feet went in the air and she hit the floor," Simo said. The shooter then kicked the woman's feet, witnesses said. "Then he put the gun under his chin and finished himself," Simo added. Colbert Watson, 48 a doorman at nearby building, said that when he heard the gunshots, he thought a car's tire had popped. But then Watson saw the woman fall to the ground. "Then he popped himself. He fell sideways. His knees buckled," Watson said of the shooter. Police didn't immediately provide further information about the circumstances or motive for the shooting. Editor's Note: An earlier version of this article stated the gunman was pronounced dead at the scene, according to NYPD officials. Police have since clarified that the gunman is not deceased.